Our sponsors mean everything to this blog. They help to keep it alive and allow us to share all of the fantastic tutorials, recipes, and mommy-isms that help each one of us get through the day! We have more than 200 visits each day and over 1300 followers -- with those numbers climbing daily!! As a stay-at-home, work-at-home, small business running mommy I like to support others who are trying to do the same. 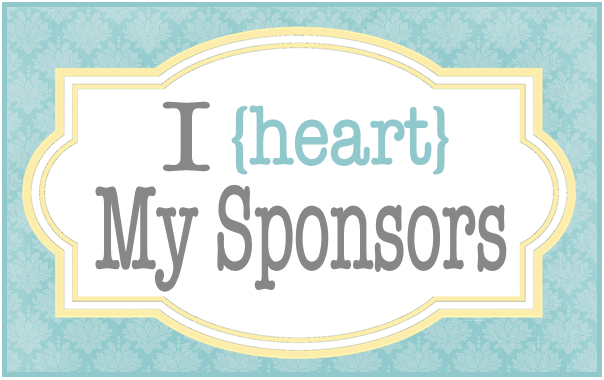 If you are interested in becoming a sponsor, here are a couple different ways you can contribute while getting some exposure for your own blog/business. Guest Posting: If you have a craft/sewing/tutorial type blog and would like to be featured here, I would love to have you create a guest post! It is so much fun welcoming new faces to our website. As a guest poster you will also get additional exposure to your own site! As a thank you, I will post your blog buton on the bottom of my page for 3 months! Reviews/Giveaways: If you are a small business owner, we would love to do a review and/or a giveaway for your products. The benefits of both a review and giveaway are that our website followers are able to get a better idea of how your product works and what others think of it. This makes your product(s) even more enticing! Giveaways are geared towards bringing you more customers/readers! They are a great way to get some PR for your company/website. As a thank you, we will post your button on the bottom of our sidebar for 3 months. If you have any questions, please feel free to contact me at kdbuggieboutique at yahoo dot com.